Since the beginning of September 2017, conflict has escalated in Deir-ez-Zor governorate as multiple parties have attempted to expel the group known as the Islamic State of Iraq and the Levant (ISIL) from the governorate. The escalation in conflict has caused large-scale displacement within and from Deir-ez-Zor governorate, with an estimated 320,000 persons displaced in September and October alone. The situation is highly dynamic, with communities emptying and repopulating sometimes on a daily basis. Restrictions on movement imposed by armed actors have resulted in the deterioration of the humanitarian situation and have led to the emergence of large information gaps concerning the conditions on the ground. In order to address these information gaps and highlight key humanitarian needs across the governorate, REACH has conducted a rapid assessment of the current humanitarian situation in communities in Deir-ez-Zor governorate that have been affected by recent conflict. Findings are based on primary data collected between 7 and 12 November through interviews with 62 key informants reporting on 53 communities across the governorate. Key informants were either still present in their communities or had left them since 1 October. Assessment findings show that conflict continues to present the most pressing threat to the safety of the population, restricting movement and access to basic services. Across the governorate, residents are living in damaged and vulnerable shelter types, such as informal tented settlements, unfinished buildings and collective centres. Key informants reported that, although markets are functioning in the majority of assessed communities, the safety and security circumstances have disrupted supply routes and represent the primary challenge to accessing food. As a result, communities are relying on personal farming and mostly cope by skipping meals and limiting portion sizes. Deir-ez-Zor city is the only location in the governorate in which formal education is available. While informal ad hoc education is available in a handful of communities, 42 of the assessed communities lack any kind of education. Further, nearly all communities are unable to access the main water network and most face issues with water quality. There is also a major shortage of qualified medical personnel and equipment, with health services being largely insufficient to meet population needs. In particular, surgery, emergency care and skilled care for childbirth are the primary health needs. With key informants expecting outward movement from 35 of the assessed communities in the coming weeks and access likely remaining severely restricted, REACH will continue to monitor and provide updates on the humanitarian situation across the governorate. 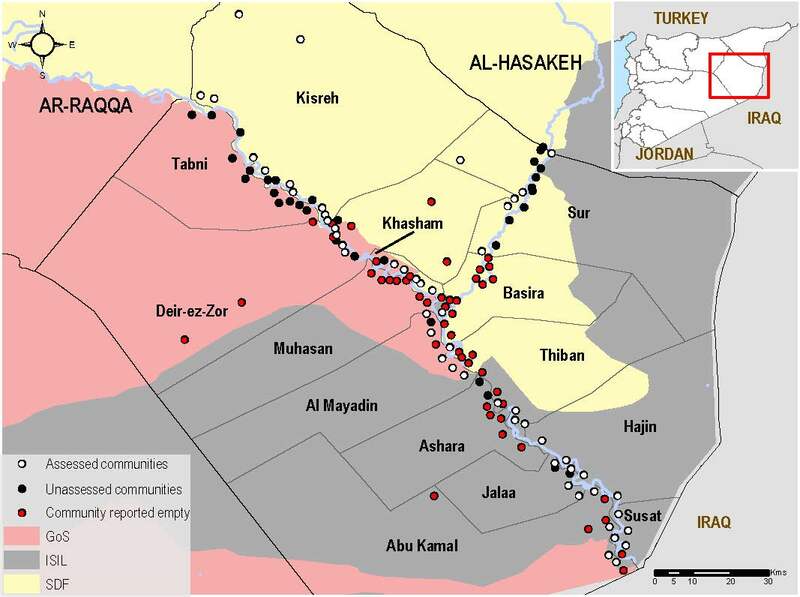 Access REACH Deir-ez-Zor Governorate Situation Overview in full at this link.